Set during the Great Depression. 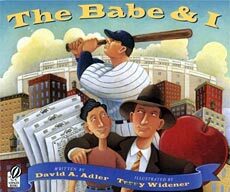 A boy finds out his dad is unemployed so he becomes a news boy at Yankee Stadium to help his family. He uses baseball news to sell a lot of papers, and one day even Babe Ruth buys a paper from him. A book about baseball...and about empathy and family. This book won the Society of Children's Book Writers and Illustrators Honor! Below are sample spreads from inside this book. To see larger versions of these spreads, simply click on the images or click here.